BBC correspondent Tom Brook was the first British radio reporter on the scene outside the Dakota apartment building in New York the night John Lennon died, 25 years ago. From his vantage point in a telephone kiosk a few yards from where Lennon was killed he filed live reports to BBC Radio 4's Today Programme, bringing the first news of the former Beatle's death to a shocked British audience. On the night of 8 December 1980 I was at home in downtown Manhattan when I received a phone call from a colleague who told me he'd heard there had been a shooting at the Dakota apartment building, and it was rumoured that John Lennon may have been wounded. Immediately I grabbed a tape recorder, notebook and a small radio and hailed a cab. The three-mile journey uptown to the Dakota took 10 minutes and as soon as I arrived I knew something was horribly wrong. A group of about 20 individuals were gathered outside the entrance to the apartment building. They looked agitated and confused. They told me there had indeed been a shooting within the past hour, they thought John Lennon was the victim and that he had been taken in a police squad car to the nearby Roosevelt Hospital. A short time later I listened to a report on my small radio confirming that Lennon had in fact died. Within the hour the Dakota apartment building became a makeshift shrine, fans in a state of disbelief, many of them crying and bearing candles, began to fill the street. I talked to them, recording some of their comments. I remember one woman, surrounded by a crowd chanting Lennon's anthem Give Peace A Chance, commenting that his death had hit her hard, it made her feel like she just been punched in the stomach. Lennon fan Mitch Weiss, a musician and songwriter, will never forget the collective grief of that night. "The whole street was filled with people, all ages, all descriptions, in groups, individually, many of them sobbing, curious onlookers, reporters, and just a lot of people in a state of shock," he recalled. Personally I didn't have time to respond emotionally, at least initially. I just raced for the nearest phone and starting filing reports to BBC radio in London. Looking back, as a journalistic endeavour, reporting on Lennon's death was not hard in mechanical terms. All that was required of me was to describe the surreal scenes outside the Dakota. What was far more challenging was keeping my own emotions in check. I had grown up with Lennon's music. I was a fan and I suddenly realised that his passing was truly shocking news. It began to hit me just as hard as it did the fans outside the Dakota, and many of the radio listeners in Britain. For my parents' generation the assassination of President Kennedy in 1963 was a truly seismic event. 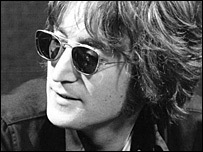 But for baby boomers Lennon's passing had far more emotional significance. 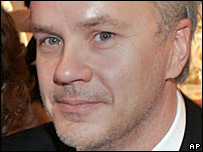 New York-based actor and director Tim Robbins was in college when Lennon was killed and he says he felt a tremendous sense of loss at the time. Robbins, 47, seems buoyed by Lennon's legacy, which he described as "brilliant poetry, great rage, rock and roll and a real strong voice". Like many fans, Oscar winner Robbins wasn't just impressed by Lennon's music, he also appreciated his wit. "I think he's introduced us into a lot of humour in song writing," he said. "One of the joys of my childhood was listening to those totally absurd and ridiculous and surreal songs. It introduced a real sense of humour in my mind." 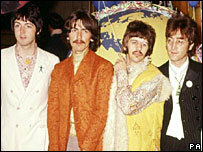 Lennon's widow has often been criticised for her actions as the keeper of the former Beatle's flame. But many think that she got it right in 2000, when she used the 20th anniversary of Lennon's death to focus attention on the act of violence that led to her husband's death outside the Dakota. 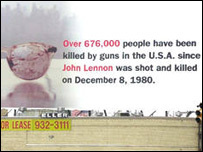 She devised a billboard which stood in Times Square, and in two other American cities, which relayed the unsettling news that since Lennon was murdered, 676,000 other people had been killed by guns in the US. It is just the kind of agitprop of which John Lennon would have approved. "John Lennon was killed two hours ago"
Is Lennon an icon to the young?